How does one build on a solid foundation? On Christ. Christ is the Rock from Which flows the Blood and Water which give life to His Church. You cannot give what you do not have. Encounter Christ. Pray daily. Pray the perfect prayer of Holy Mass every Sunday and on holy days. Prayer that is intentional, engaging the heart and mind, enjoys the presence of the Lord through the Holy Spirit. One who meets and knows Christ dares to share Him with others. 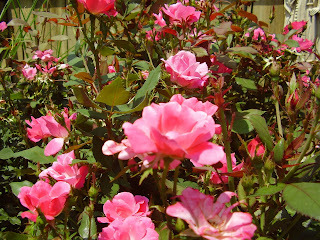 Practice active charity in the family and with your neighbor. If Christ is Present He makes Himself known in word and action. Possess Christ. His presence will be made known by the true joy only He can give. We are not overcome by the sorrows of this world as we look with confidence and the hope that faith brings to the charity without end in Heaven. Christ is Risen. His Life, possessed as a treasure that cannot be taken away, leads surely to life everlasting. Meeting Christ in the Liturgy offers a reflection for The Ninth Sunday of Ordinary Time. "On the occasion of the traditional World Day of Prayer for the Sanctification of Priests that is celebrated on the Feast of the Sacred Heart, I would like to recall the priority of prayer over action since it is on prayer that the effectiveness of action depends. 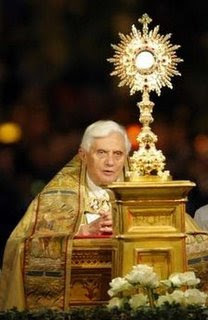 The Church’s mission largely depends on each person’s personal relationship with the Lord Jesus and must therefore be nourished by prayer: 'It is time to reaffirm the importance of prayer in the face of the activism and the growing secularism' (Benedict XVI, "Deus Caritas Est," No. 37). "St Thérèse of the Child Jesus, aware of the extreme need of prayer for all priests, especially those who were lukewarm, wrote in a letter to her sister Céline, 'Let us live for souls, let us be apostles, let us save above all the souls of priests…. 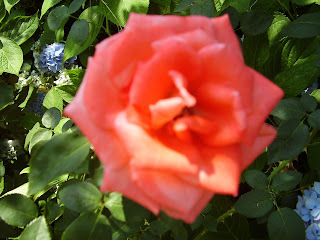 Let us pray and suffer for them and on the last day Jesus will be grateful' (St. Thérèse of Lisieux, Letter 94). "Let us entrust ourselves to the intercession of the Blessed Virgin Queen of Apostles, our sweetest Mother, let us look to Christ with her, ceaselessly striving to be totally, radically his; this is our identity! "Let us remember the words of the Holy Curé d’Ars, Patron of Parish Priests: 'If I already had one foot in Heaven and I was told to return to the earth to work to convert sinners, I would gladly return. And if, to do this, it were necessary that I remain on earth until the end of the world, always rising at midnight and suffering as I suffer, I would consent with all my heart' (Brother Athanase, "Procès de l’Ordinaire," p. 883). "May the Lord guide and protect each and every one, especially the sick and those who are suffering the most, in the constant offering of our life for love." may be ever present in the life of Your Priests. Amen. The present decree enters in force immediately after its publication in L'Osservatore Romano. 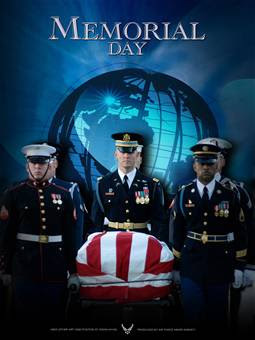 "I would like to offer a tribute to your many friends who have paid with their lives for fidelity to their mission. Forgetting themselves and despising danger, they rendered the community a priceless service. Today, during the Eucharistic celebration, we entrust them to the Lord with gratitude and admiration. But where did they find the strength necessary to do their duty to the full, other than in total adherence to the professed ideals? Many of them believed in Christ, and his words illumined their existence and gave exemplary value to their sacrifice. They made the Gospel their code of conduct. May the example of your colleagues, who in faithfully doing their duty reached the heights of heroism and, perhaps, of holiness, be an example to you." Last Sunday, AMS Archbishop Timothy Broglio was the main celebrant during the 14th Annual Memorial Day Mass held at the National Shrine of the Immaculate Conception in Washington, DC. EWTN cameras were present in order to make possible its broadcast this Memorial Day weekend (check local listings for time). Immediately thereafter, EWTN will air CatholicMil.Org's production of In God We Trust, written in response to the events of September 11, 2001 and dedicated to today's military personnel and their families. CatholicMil.Org will make available a DVD of In God We Trust (IGWT), as already there has been much interest. Currently, there are only 297 Catholic chaplains minister to 1.2 million Catholics in their pastoral care. It is not for lack of vocations, but for lack of response. It is our hope "In God We Trust" will also serve to inspire more brave Catholic men to affirmatively respond to the call to serve in the Chaplain Corps. "For the Monsoor and Richard families, this is the first Memorial Day after their loved ones’ deaths. But this time of year will always bring back memories for the family of Father Timothy Vakoc. "It was soon after Memorial Day in 2004 that the Army chaplain was injured by a roadside explosion in Iraq. It was the 12th anniversary of his ordination, and he was returning to base after celebrating Mass...."
Archbishop Broglio's comments on Fr. Capodanno appropriately conclude the article. The Register is one Catholic publication that regularly commits to covering events and issues of concern to today's military. If there is a military family in your life, give them the gift of a subscription to National Catholic Register. Tell them about CatholicMil.Org, and the intercessor we all have in Servant of God Fr. Vincent Robert Capodanno, LT, CHC, USNR. PS. The Flag Code states: "To place the flag at half staff, hoist it to the peak for an instant and lower it to a position half way between the top and bottom of the staff. The flag is to be raised again to the peak for a moment before it is lowered. On Memorial Day the flag is displayed at half staff until noon and at full staff from noon to sunset." ...even until the end of the world." 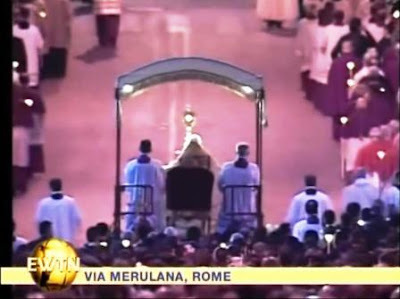 Our Holy Father and the Corpus Christi procession Thursday from Saint John Lateran Basilica to Saint Mary Major Basilica along the Via Merulana in Rome. His promise comes true in the most wonderful way each time we truly meet Him again in the offering of the Holy Mass and the Eucharistic Sacrament of the Altar. 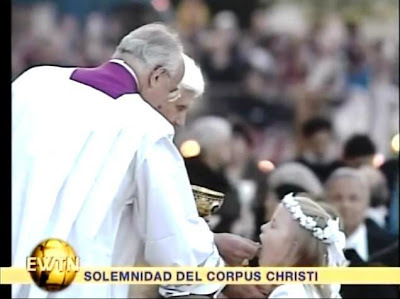 Meeting Christ in the Liturgy offers a reflection for The Solemnity of Corpus Christi. Virgin Most Holy, Mother of the Incarnate Word and our Mother, venerated in the Shrine of Sheshan under the title "Help of Christians", the entire Church in China looks to you with devout affection. "Kneeling before the Eucharist is a profession of freedom"
Total love demands a total gift. The gift each person is called to give in love is nothing other then the self, entire. Love Divine and Incarnate does this on the Cross and in the gift of His Body and Blood in the Eucharist: the perfect Gift of God Himself demanded by the perfect Love of God Himself. "Adoring the God of Jesus Christ, made bread, broken for love, is the most valid and radical remedy against the idolatries of yesterday and of today. Kneeling in front of the Eucharist is a profession of freedom: who bends to Jesus cannot and must not prostrate before any earthly power, as strong as it may be. We, Christians, kneel only before God, before the Most Holy Sacrament, because we know and believe that in it is present the one true God, who has created the world and has so loved the world to give his only begotten Son. "We prostrate before a God who first inclined himself toward man, as Good Samaritan, to rescue him and give him life, and who knelt before us to cleanse our filthy feet. Adoring the Body of Christ means believing that there, in that piece of Bread, there is truly Christ, who gives true meaning to life, to the immense universe as well as to the smallest creature, to the entire human history as well as to the briefest existence. The adoration is a prayer which prolongs Eucharistic celebration and communion, and in which the soul continues to nourish itself: it is nourished with love, with truth, with peace; it nourished itself with hope, because the One before whom we prostrate does neither judge us, nor humiliates us, but transforms us and makes us free. "Ecco perché radunarci, camminare, adorare ci riempie di gioia. Facendo nostro l’atteggiamento adorante di Maria, che in questo mese di maggio ricordiamo particolarmente, preghiamo per noi e per tutti; preghiamo per ogni persona che vive in questa città, perché possa conoscere Te, o Padre, e Colui che Tu hai mandato, Gesù Cristo. E così avere la vita in abbondanza. Amen." All communicants knelt to receive Holy Communion on the tongue from the Holy Father at Corpus Domini Mass in Rome today at his cathedral church of Saint John Lateran. The extraordinary form low Holy Mass offered on board USS Theodore Roosevelt. One of our readers commented on the lack of six candles on the altar. The rubrics limit the number of candles at a low Mass to two. Photo: Courtesy of Chas. Johnson, Sac. "[M]y visit to Savona, on the feast of the Most Holy Trinity, is above all a pilgrimage, through Mary, to the fountains of faith, of hope, and of love. A pilgrimage which also is remembrance and homage to my venerated predecessor Pius VII, whose dramatic life is indissolubly linked to this city and to its Marian shrine [Our Lady of Mercy]. 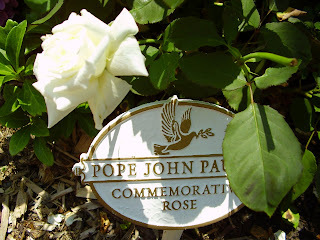 "With the distance of two centuries, I come to renew the expression of the recognition of the Holy See and of all the Church for the faith, the love, and the courage with which your fellow citizens sustained the Pope in his forced residence, imposed upon him by Napoleon Bonaparte, in this City. Numerous testimonies of the gestures of solidarity to the Pontiff by the Savonesi, at times even at personal risk, are preserved. They are episodes which the Savonesi of today may remember with pride. "As your Bishop has fairly observed, that dark page of the history of Europe became, by the power of the Holy Spirit, rich of graces and of teachings, even for our days. It teaches us the courage to confront the challenges of the world, Materialism, Relativism, Laicism, without ever yielding to compromises, willing to pay in person in order to remain faithful to the Lord and to his Church. The example of serene firmness given by Pope Pius VII invites us to keep the faith in God unchanged in the trials, in the knowledge that He, if also allowing difficult moments for his Church, never abandons her. The event lived by the great Pontiff in your land invites us to always trust in the intercession and in the maternal assistance of Mary Most Holy." God has an interior life as does every being. 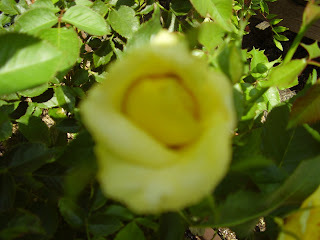 Yet God does not need to go outside of Himself to find happiness as does every other being. God's inner life is perfect love. The community of persons, Father, Son and Holy Spirit, share Divine love, perfect and without end, and never cease to be at the same time One God. Meeting Christ in the Liturgy offers a reflection for The Solemnity of the Most Holy Trinity. Our Lord, with the words "Behold thy Mother" as He died upon the cross, gave His own Mother to the whole Church to embrace also as our maternal refuge and help for salvation. The people of God call upon Mary our Mother and give witness to our devotion in obedience to Christ before the world with a procession to Our Lady's shrine. The first communicants in their special garb and members of the Liguori Society in cassock and surplice add to the solemnity of the May crowning. Castel San Angelo, the dedicatory bronze statue of the archangel Saint Michael atop it, the most fortified stronghold in the city, was built as Hadrian's Tomb and later adopted for use by the Roman pontiffs during the days of barbarians and frequent invasions of Rome. Massive moats, now dry, still surround the fortress and mark the limits of a park popular for Romans under the umbrella pine trees around the castle. This view is from one of the many bridges that cross the Tevere, or Tiber, river which flows down to Ostia, which comes from the Latin for "mouth", the name of the city which once was famous as the gateway seaport for the ancient capital of the farflung empire. The heights of the Gianicolo hill afford some of the finest views of Rome. 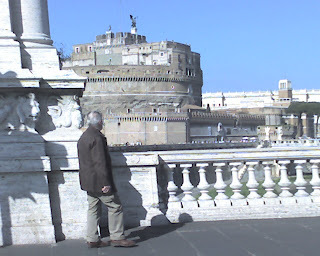 Castel San Angelo, refuge of popes during the sack of Rome and dedicated to the Archangel Saint Michael, is visible with the massive Palazzo di Giustizia, or palace of justice, to the right. 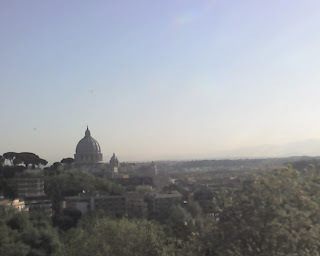 The line of trees between these landmarks line the Tiber River on its way through the city. 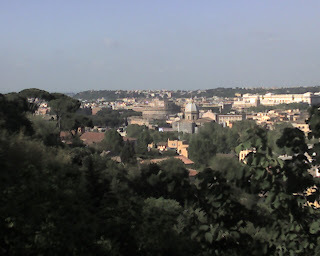 The dome of Saint Peter's basilica and the Alban hills south of Rome visible to the right. 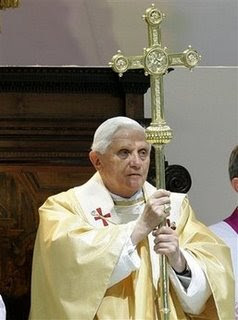 "To you I give the keys of the kingdom", Our Lord's words to Saint Peter, are a commissioning to the first of the Apostles and all his successors down to Benedict XVI in our own day, charged with "strengthening the brethren" in the holy Faith. The monumental statue of Saint Peter in the piazza which bears his name is a reminder of the wonderful gift to the Church of the office of the papacy, sign and source of unity for the Church. Yesterday I had the blessing of offering Holy Mass at the altar of Saint Leo the Great in Saint Peter's Basilica. The greatest church in Christendom is quiet and calm in the early morning. Various priests enter the sacristy to vest for Mass and then walk out to the great church to find an available altar for the offering of the Holy Sacrifice. I celebrated in Latin at the altar of St. Leo the Great. I attended the general audience in Saint Peter's square and heard our holy father's reflections on his recent pilgrimage to the United States. He continues to reflect upon and benefit from the blessing of his days among us as we come to understand more profoundly what this gift means to all of us. His praises the USA as a "valid example" of the lay state which allows for freedom of religious expression. Vatican City State continues the ancient and scriptural Thursday liturgical celebration of the feast of the Acension, forty days after the Resurrection. Mass for the Feast was offered at Saint Peter's today at the altar of the chair in Latin with Gregorian chant. The state of Italy celebrates a secular holiday on May 1. The church in this country transfers the feast of the Ascension to the following Sunday as we do in the United States.